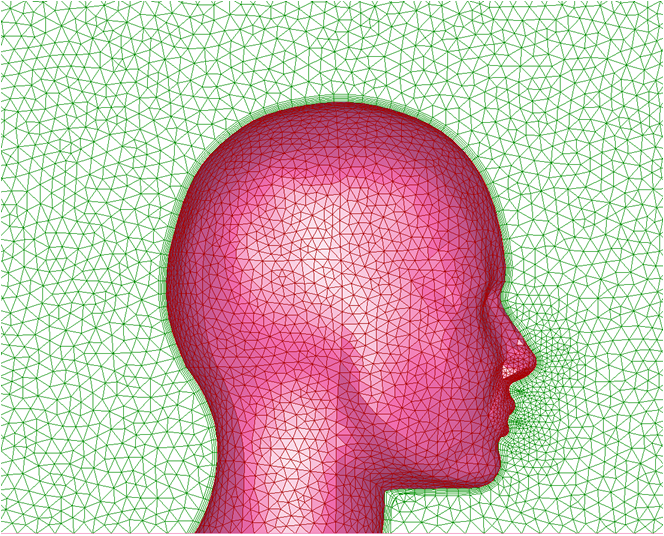 Earlier this year, Chris Sideroff wrote an entry on the Pointwise blog, “How Meshing Stole a Year of My Life,” in which he explained how creating a mesh for personal micro-environment studies took months to complete during his Ph.D. research in 2007 (see Figure 1) but now could be completed in a matter of minutes using Pointwise (see Figure 2). As a bonus, the resulting mesh is better than the best he could make back then. 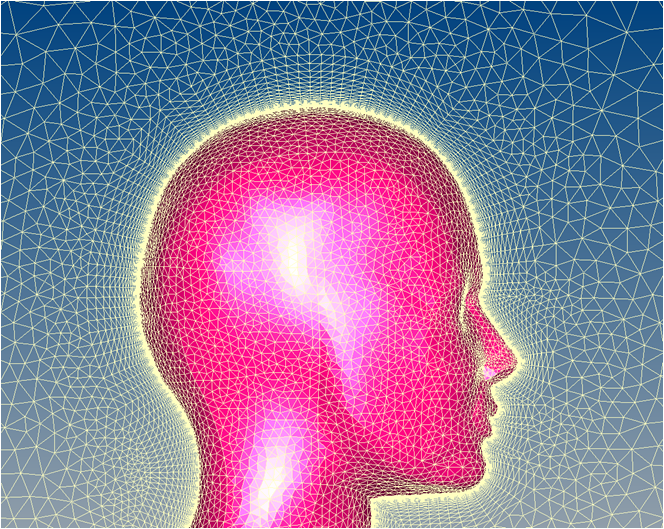 As you can tell from the title, the blog post is written in a humorous tone, but it carries a serious message – Pointwise is a quantum jump forward in meshing capability. Figure 1: Months of work in 2007. Figure 2: 45 minutes of work in 2012. Native CAD import reduces translation errors, cutting the time needed for CAD cleanup. Solid Meshing further reduces or eliminates CAD cleanup time and simplifies working with complex models. Pointwise's T-Rex meshing technology automates creation of high-quality boundary layer meshes. Glyph scripting can be used to further automate meshing and even add new capabilities to Pointwise. Pointwise reads CAD models from ACIS, Catia V4/V5, Siemens PLM NX, Parasolid, Pro/E, and SolidWorks files, as well as from IGES and STEP. This is not an optional, additional cost item. It is a standard part of Pointwise and does not require a license of the CAD system either. 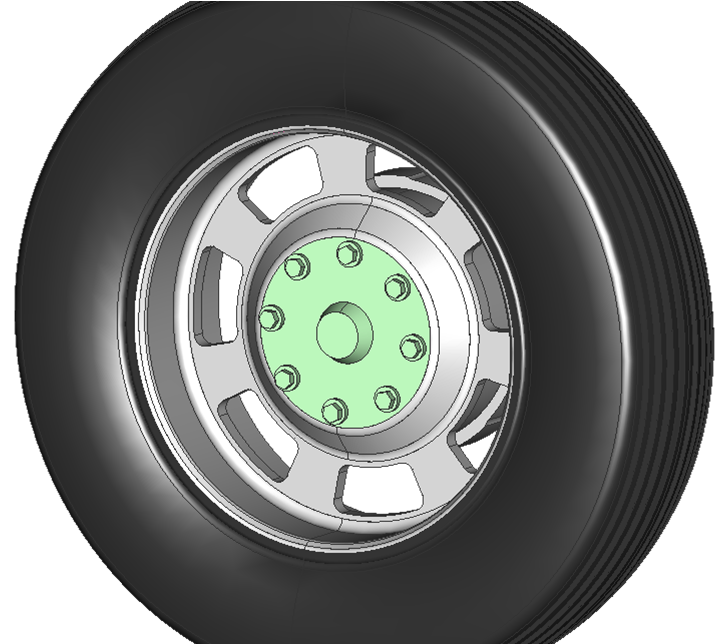 Reading native CAD files eliminates a translation step, so CAD models generally come in cleaner and need less manual cleanup, saving you time and frustration. Solid Meshing starts with CAD solid modeling technology and adds a meshing-specific entity, the quilt, which lets you specify meshing regions directly on the CAD geometry. If you are importing a geometry that already includes solid models you know all the surfaces are connected and need no cleanup. If you are dealing with an older CAD file that is not solids-based, you can easily convert your geometry to solid models in Pointwise so you know any gaps and overlaps are healed. Once you know the model is watertight, you can specify quilts that define specific meshing areas. The boundaries of quilts will be the boundaries of your surface grids. Instead of dealing with hundreds or thousands of surfaces during meshing, you only have to work with a few quilts. Quilt boundaries show up as grid boundaries, but complexities of the CAD topology inside a quilt are ignored, which keeps odd CAD topology, like slivers, from degrading grid quality and allows for simple defeaturing. An example of the power of quilts is shown on the wheel and tire model in Figures 3 and 4. The CAD geometry has been assembled into three quilts: a black tire quilt, a gray wheel quilt, and a green hub quilt. 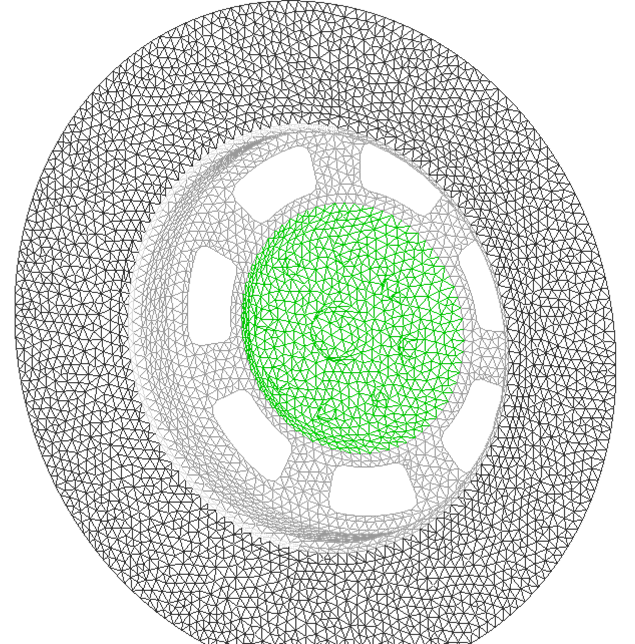 Note the hub quilt includes fine geometric details, the lug nuts and bearing cover, which we do not want to resolve in our computational fluid dynamics (CFD) simulation. By placing this geometry within a quilt, we are telling Pointwise that we will use the geometry to determine the shape of our grid but we do not need to follow the boundaries of each CAD surface. As you can see in the completed mesh, the grid points are on the geometry, but CAD topology internal to the quilt is not followed. Figure 3: Three quilts (black, gray, and green). Figure 4: Features inside quilt are approximated. If you want to see more Solid Meshing in action, watch our recorded webinar, Working with Dirty CAD While Meshing a Naval Ship Hull. T-Rex is short for anisotropic tetrahedral extrusion. T-Rex starts from a triangular surface grid and extrudes layers of tetrahedra outward. The extruded tetrahedra have included right angles so they're of higher quality than other types of high aspect ratio tets. The tetrahedra can later be combined into prisms to reduce cell count and accommodate CFD solvers that require them near boundaries. The advantage of extruding tetrahedra is that the extrusion layers are fully unstructured, so the extrusion can stop locally when it encounters problems and keep going in other locations, producing the maximum possible number of layers everywhere. T-Rex checks for cell quality and interference with adjacent geometry and extrusion layers and automatically stops locally where problems are encountered. 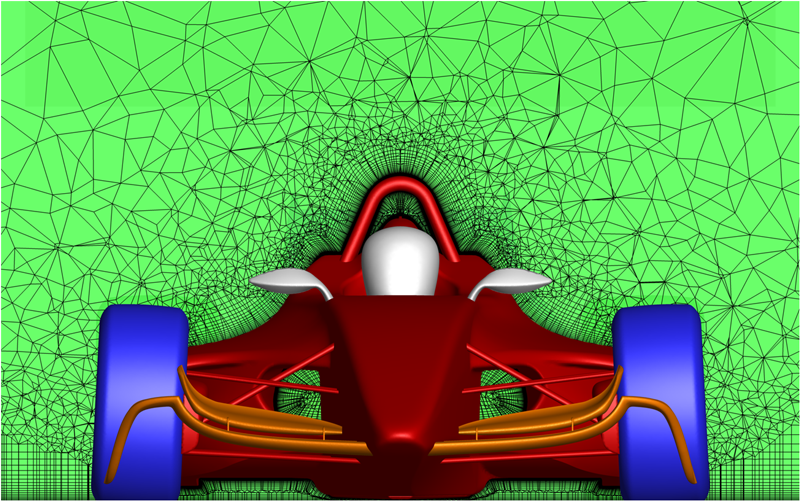 Figure 5 shows a slice through a T-Rex volume mesh for an open-wheel race car. The slice is taken behind the driver and shows the regular, stacked T-Rex layers extruded from the car and the ground. Under the car you can see where the layers from the ground and the car approach each other, but stop a short distance apart. In other areas, the layers extrude until the cell heights have grown large enough for the tetrahedra to become isotropic before stopping. Figure 5: Slice through a T-Rex volume mesh. You can see how the North American Eagle team is using Pointwise's T-Rex technology in their quest to break the land speed record in our webinar, Attempting to Break the Land Speed Record with the Help of CFD. Pointwise has a full scripting language, Glyph, that includes control constructs, variables, math expressions and procedural access to all Pointwise commands. Glyph can be used to automate all or part of a meshing process, to couple Pointwise with optimization or other software, and to extend the capabilities of Pointwise. Scripts can be run interactively or in batch. If you want to quickly learn more about Glyph scripting, watch our recorded webinar, Automating Viscous Meshing for a Transonic 1Aircraft Model Using Glyph Scripting. Each of these meshing capabilities on its own cuts the time needed for meshing and helps to make higher quality meshes. When you add them all together, you reduce meshing time from months to minutes and you end up with better quality meshes, as Chris Sideroff saw in his work. If you are a current Gridgen user and have not yet made the jump to Pointwise, a good place to start is with our introductory videos. They will give you a quick overview of how Pointwise operates. Alternatively, you might want to come to one of our training courses and interact directly with our Technical Support Team. As long as you have current maintenance, it's free! If you are not a Pointwise customer, you might want to watch the introductory videos referenced above. Or if you are ready to get your hands on Pointwise right away, fill out the free evaluation request and we will get you set up with a temporary license of the software. If you are not already using Pointwise, you really should be.